A former top civil servant, Dr. Don Thornhill is a board member and a consultant and adviser on strategy and policy. He currently chairs the Legal Services Regulatory Authority, the Chartered Accountants Regulatory Board and the Joint Standing Committee of the Dublin Maternity Hospitals. He is also a Board member of the National Concert Hall. 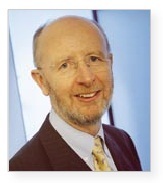 He is a former chair of a number of organisations including the National Competitiveness Council of Ireland, Hibernia College, the Fit for Work Coalition, the US/Ireland Fulbright Commission, the Irish Payments Services Organisation, the INSPIRE interuniversity nanoscience consortium and the Atlantic Philanthropy funded Ageing Well Network. Other board memberships have included Forfás (Irish statutory national policy advisory body for enterprise and science), the Irish Management Institute, the Irish Taxation Institute, Science Foundation Ireland, the Irish Hospice Foundation, the Foundation Board of the Royal Dublin Society and the Digital Hub Agency. He was chairman of the 2012 Inter-Departmental Expert Group which designed a local property tax which has now been enacted into law. In February 2015 he was asked by the Minister for Finance to review the operation of the property tax and to recommend what changes if any should be recommended. This report (available at http://www.budget.gov.ie/Budgets/2016/Documents/Review_of_Local_Property_Tax_pub.pdf) has been published and partially implemented. During his career in the public service he was centrally involved in many of the transformational policy developments in Ireland in education and research and, earlier in his career, in tax policy and administration. He played the key role in the development and roll out of the €600m Programme for Research in Third Level Institutions (PRTLI) which was the first major strategic investment made by the Irish Government in research at university level. In January 2005 Don completed a seven year term as Executive Chairman of the Higher Education Authority (HEA). Prior to his appointment to the HEA he was Secretary General of the Department of Education and Science from 1993 to 1998. He also worked in the Irish Revenue Commissioners, the Departments of Foreign Affairs and Finance and in the Unilever group of companies. Don is a graduate of University College Dublin (B.Sc. and Ph.D. (Chemistry)) and Trinity College Dublin (M.Sc. (Econ)). He was awarded an honorary doctorate by the National University of Ireland in 2007. During 1987 he was a Fulbright Scholar at the Brookings Institution in Washington DC. Dr. Thornhill is an elected member of the Royal Irish Academy and of the Irish Academy of Engineering. He was conferred with honorary life membership of the Royal Dublin Society for his services to Ireland.